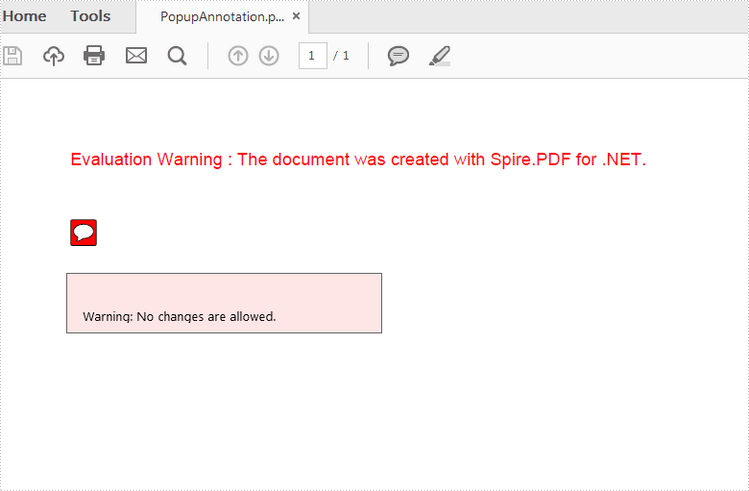 Popup note is one type of annotations, which pops up a message that the document author leaves for the readers when moving cursor over the icon. The article aims at introducing how to add a popup note into PDF page at specified location in C# and VB.NET. Step 1: Create a PDF document and add a page to it. Step 2: Construct an object of PdfPopupAnnotation based a RectangleF, which represents the annotation position. Step 3: Set properties of the annotation including text, icon type, and icon color. Step 4: Add the annotation to the page. popupAnnotation.Text = "Warning: No changes are allowed."